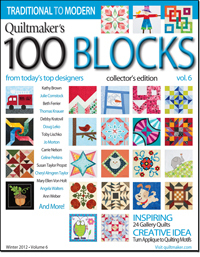 I am so excited to have my block appear in Quiltmaker’s 100 Blocks Volume 6! This issue is jam packed with amazing blocks that will make you want to get your sewing on!! And one of those blocks is my Shabby Spin block!! 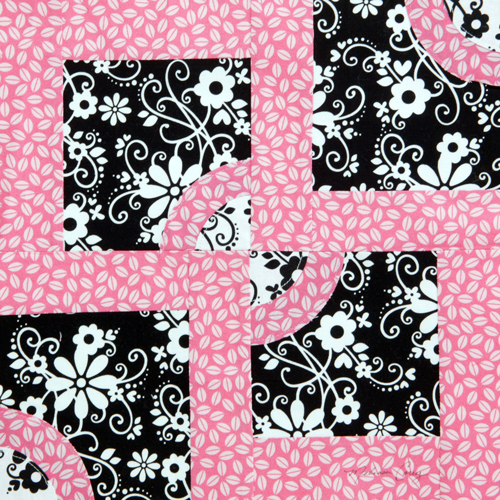 This block combines applique and piecing, which I just had so much fun with. The Shabby part of the name comes from the raw edge applique, so fun when it gets a little ruff around the edges after washing. And the Spin part of the name . . . well the quilt layout show that off. Don't you just love how it keeps your eye spinning around the quilt. So that's Shabby Spin! I hope you like it :) Be sure to follow the 100 Blocks Blog Tour every day from Nov 5-9 at The Quiltmaker Blog Quilty Pleasures to see all of the blocks and have a chance at lots and lots of giveaways! For 3 lucky readers, I have 3 copies of Quiltmaker's 100 Blocks Vol 6 and to each copy I will be adding my newest patterns, Wonky Irish Chain and Dreaming of Paris. And that's it. Up to 2 comments per person. International entries are welcome. Mr. Random.Org will choose 3 lucky winners and announce them Saturday morning. So leave your comments and then enjoy your hopping!!! ery cute block. I'd love to know how the block designers come up with such different and great blocks. Great block and great book. Count me in! That is a very cool block and looks fantastic as a quilt. Great block! I can't wait to get my hands on this magazine. Wow, congrats! I can imagine your block out of 30's reproduction prints, or bright solids and linen mixes, text-- it's a great block! Ditto the Wonky Irish Chain-- lots of potential for spinning it! Congratulations! Must be fun to see your work in print. Thank you for a great giveaway! I love it! The Combination of applique and piecing is interesting. Dreaming of Paris looks like a pattern I'd like to try. Thanks for your lovely give away and a chance to win! Interesting block. Thanks for the chance! It is a nice block. Thank you. Boy, I'll really be excited if I win a copy of the magazine *and* your wonky Irish Chain pattern! Awesome block! Love the wonky Irish Chain too. Perfect for a little gift to that someone special who has everything. I love the blog tour because it introduces me to new teachers. Congrats. Great block! I'd love to win that giveaway! I've never had that magazine and I'd love to try your patterns! I will probably join your Q-A-L. Love working in stages. Love seeing your block made up into a quilt. Looking forward to seeing the quilt you're making with it! The block looks great! I love seeing the blocks from the book in a layout. Congrats on being in the magazine. I love the originality of your block! I've enjoyed these 100 blocks magazines and expect this one will be wonderful as well. Yep, it sure does spin-love the effect. Way to go, girl. Your block looks pretty as a quilt. I have a hard time envisioning how several blocks will look together since the magazine just has the block, so I appreciate seeing it together. pretty! I am a follower! I was looking at an older quilt magazine I had saved last night and there was a moda bake shop ad on the back cover and your name was one of the designers! Your picture was a quilt. My first comment is I am glad I got up this morning and have the freedoms that our soldiers have fought so hard for. Wow, love the way those blocks work together! Beautiful! awesome block, using yellow for the small wedge? An unusual block, I love the way it looks in a full quilt. Congrats on making the magazine! Can't wait to get my copy (whether by winning or buying!). Thanks for making it easy to enter! Great block! I am a follower. Your blog is great. Thanks for chance to win this generous giveaway! Lovely block! I love the inspirational quilt you provided. It looks wonderful! Oh wow, how generous of you...would love to win! I have been a follower for quite a while and enjoy your postings very much! Very cool block and quilt. I just might have to give that one a try myself. I've been following you for a while now. I love your block. The black and white makes the pink pop. Wow, I think there are a lot of possibilities with this block. Wonderful, thanks. This block is awesome, it seems so whimsical, good job, and congratulations! I really like the look when putting all the blocks together! Shabby Spin is a love knot block - very cool put together. Cool block! Makes a great looking quilt! So nice of you to throw in extra patterns too! I love the combinbation of pink and black and white. Love your block pattern and am anxious to see what you do with it in your selected colors. Nice block. Congratulations on the magazine. Very cute block! I just got so that I'm comfortable sewing curves so I'm always looking for a new twist. This block sure is nice and does have a great overall design! This will be a great one... can't wait to see the magazine. What a neat block Melissa!! Can't wait to see a picture of the one you are working on. Thanks for a chance at winning the mag. I will try your block, too cute! Your block is so cute and I am even more impressed knowing that you have five children AND the energy to be creative as well! Thanks for all your posts...and the give away! I am a follower on google reader! Congratulations on being in the '100' - love versatile blocks. CAn't wait to see the teal version worked up! Great block! I love it en masse! Love this block...there's sew many possibilities!!! Thanks for the chance to win! Thank you for having such a great giveaway!! That block makes a great quilt! Thanks for creating it! This one was fun and Easy! I would love to win your patterns. I love this block. The pinks and blacks are really cool together. I would love to win your new patterns. I just became an email follower. Great block. It does intertwin well. Love the block, especially in the colors that you chose. Thanks for a chance. What a cool block!!! Thanks for sharing! Love the colors. I'm gonna do one! Love your block. Thanks for the chance to win. What a great giveaway and block! And yet again you have come up with another amazing block for Quiltmaker's 100 Blocks, Volume 6. I am a follower and enjoy every minute spent with you. You are a very talented designer and the most giving person around. Thank you for giving all of us a chance to win this magazine full of inspiration and ideas, and 2 of your patterns as well. What a great giveaway. Thanks, Love the block! Really unique block and what a generous giveaway. Thanks for the chance to win! Love your block, congrats on being in the magazine!! Thank you so much for this pattern!! 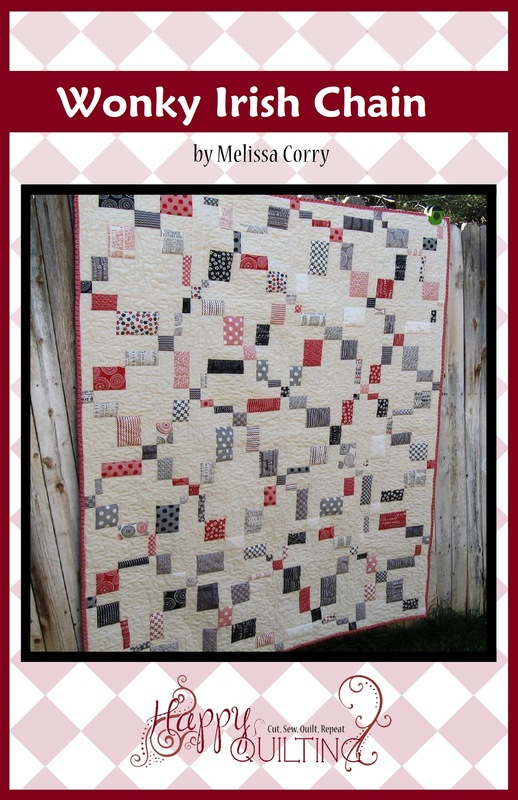 I just ordered the Drunkards Path die from Accuquilt on Saturday and it is on its way to me now! I have been trying to think of more ways to use it to justify buying it so yeppers! I did good in ordering when I did!! Can't wait to get my hands on a copy of Volume 6!! I am a lurking follower! Love your stuff. It's pretty exciting to be in a mag! Congratulations. Nice block, congrats and thanks for the chance to win. Congrats on having your block in such a great magazine!The Wonky Irish Chain pattern is certainly intriguing! Great block - I love the gridwork-look it creates when laid out in a quilt! Thanks for the inspiration and for the chance to win (love your patterns, too!!!). I am a happy follower of your blog :-) Thanks for the extra chance. I love this issue--so full of inspiration. Your patterns are totally cute and amazing, too. Great block made in terrific colors...it has a real punch! Congrats on your new patterns! Great block! Love how it looks in a quiltsetting! Thanks for a second chance being a follower! Love the colors you used for your block!!! Great block! Thanks for the giveaway. I love your Shabby Spin block! Hello Melissa. I love blocks that make your eyes move! Your block makes me think of the spin cycle in a washing machine. :) Just stopping by to say "hello". Don't enter me in the giveaway, I'm on the tour, too. Have a super day! What a fun block. Thanks for the chance to win, and love your new patterns. Love your block. It is really adorable. Thanks for the chance to win a copy! I'm an old follower too - well not "OLD", but I've been a follower for a while. I do love your block. And your patterns too! Would love the chance to win. What a neat block! Love the look of it as a quilt! Such a great block! The movement it offers when combined with like blocks is brilliant. Great block and I love the spin. Such wonderful movement! Pretty block and I like the spin idea. I also like a black and white quilt with a shot of color so really enjoyed it. I love your block and what it does when there are multiple. the movement is fantastic. oooh I love this block, I can see it in turquiose and black.....or pink and black or....oooh the possibilities are endless. I love your block! That would be much fun to play with. I already follow you by email! I love your block and your new wonky irish chain pattern is on my Christmas list! Thanks for the giveaway! Your block design is great! I always love how your blocks can be changed around to make a variety of quilt patterns, wonderful block. Drunkard's Path variations are so fun! I have dusty templates that need a workout. Wonderful blocks! And thanks for the giveaway! I love the pink and black! Thanks for the chance to win. Fun block...at first I thought oh no, there's curved piecing but then I saw raw edge applique and my heart went back to normal! Thanks for the fun giveaway. Awesome block and patterns :) Thanks for the chance to win. And I am a follower of your blog! Love your blog, love your block, love your patterns. Hope I win! Hi! 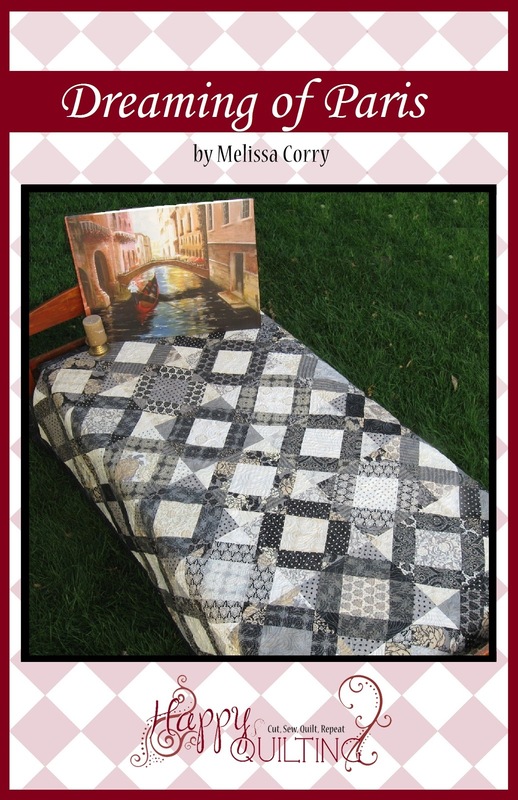 Love your Shabby Spin block and quilt pattern. Would love to win 100 Blocks vol.6. Thanks for the chance. I love how one block put with many others changes the look. I really like how it works put in a quilt. That is a fun block/quilt! I follow your blog and your Pinterest account. Thanks for the opportunity. Melissa, what a fun block. Love how it looks as a complete top. Thanks for the chance to win! love the way the quilt looks all put together. 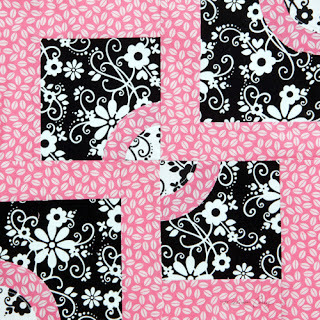 Nice block, so you appliqued the white quarter circle and the pink ring onto the block? I own two of the six volumes of these magazines and come back to them over and over when looking for inspiration...would love to add this volume! What a fun block! Thanks for the sweet giveaway! I'm already a happy follower :o) Thanks again! Lots of inspiration in all those blocks!